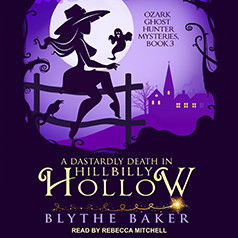 Blythe Baker presents Book 3 of the Ozark Ghost Hunter Mysteries. In the sleepy town of Hillbilly Hollow, the dead are waking . . . When her cozy hometown is visited by death, Emma's investigative skills are enlisted by a secretive ghost. But with the uncooperative spirit holding so much back, and with the handsome local doctor pressing Emma for answers, will she ever get to the bottom of the case? Or will the Hollow be forever haunted by the secrets of the past?